This course is ideally addressed to expectant moms but also to postpartum moms. Sleep is a given for most adults until they are new parents of a newborn. Sleep workshops are addressed to expectant parents ideally, and parents of babies from birth to 12 months-old as well. We often hear the expression “sleep like a baby” but Baby Sleep is actually vert different from what we think. It is important for parents to learn about Baby Sleep. Education and knowledge are powerful. The earlier you know about Baby Sleep – and also lack of sleep – aka as sleep deprivation – the better educated choices you will make as regards your baby’s sleep habits and the more rested you will be. Learn about sleep, sleep patterns, light sleep and deep sleep, the number of hours of sleep a baby needs during the night and during the day, the importance of nap times and how to safely put a baby to bed. Learn how to read your baby’s cues, sleep/awake window, and what can disrupt baby’s sleep from immunizations, to travel or sickness. The more you know, the easier it will be for you and your partner to understand your baby’s sleep patterns and what to do and what not to do. There are many sleep training styles. The workshops are following Kim West, aka the Sleep Lady and will follow the gentle sleep coaching style. Who is Baby Sleep Workshop for ? What is covered in Baby Sleep Workshop? 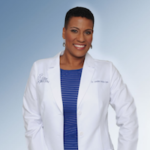 I am Dr. Lanalee Araba Sam, a Diplomate of the American Board of Obstetrics and Gynecology, I have been been practicing medicine for over 16 years. I founded Elite Obstetrics and Gynecology in Fort Lauderdale, Florida in 2004 and am myself a single mother of a teenage son as well as active in leadership roles with the American Medical Women’s Association, Broward County Medical Association and numerous local and national charities focused on women’s health. In 2015, I had the pleasure of meeting Valerie Massoni, President and Founder of Body Belly Baby in Miami at her studio. I was both delighted and impressed to see what she had created along with the incalculable value she has been bringing to pregnant patients and new moms. I was very pleased to see her level of expertise and knowledge, but even more so, to see her passion and genuine love for the mission she had set for herself. She is, in my opinion, a penultimate expert in pregnancy and postpartum fitness as well as, prenatal and postpartum Pilates. On our first meeting, we immediately jumped into a discussion about the importance of a healthy pelvic floor and Kegel exercises during and after pregnancy. Her knowledge and dedication to the education of women is admirable. I truly wish all of my patients could have access to Body Belly Baby but distance and traffic between Miami and Fort Lauderdale has not allowed that fully. Valerie and I share the same view and mission to improve the quality of pregnancy and women’ health not only during and after pregnancy but also during labor- which is critical especially in our country. Valerie has earned many certifications – she is a Pilates Master, a certified Lamaze International educator, an infant massage USA educator… and many more in addition to her solid academic background as a Harvard Graduate Student. She has a vision to improve the health of pregnant women and new moms in the US. She created a concept and center that every expectant woman dreams of and needs and a place where new moms love to go to with their baby to recover from pregnancy and labor and get back in shape. I believe that quality should always come before quantity in terms of medicine, wellness and fitness services. The attention and care Body Belly Baby has built and delivers clearly reflects this philosophy. Consequently, I am a proud advisor to Valerie and Body Belly Baby and recommend any pregnant woman and new mom to be part of the Body Belly Baby community. As briefly noted above, the fact that my practice is located in Fort Lauderdale, approximately 40 miles from the Miami Body Belly Baby center. This has frustrated both myself and my patients who would like to most of my patients love to attend classes and courses there. It is my sincere hope that Valerie will soon expand her business model to place a center close to me and, one day, all across the state and country educating and contributing to the well – being of as many women as possible.